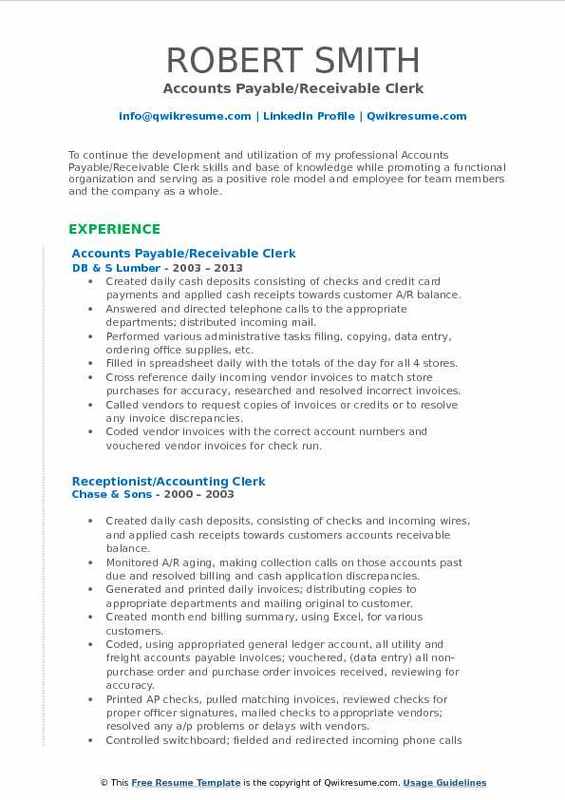 The role of an Accounts Payable Receivable Clerk Resume is to gather and sort documents and related information for goals set. The individual is also responsible for payment of invoices which includes verifying transaction information, scheduling and preparing disbursement and obtaining authorization of payments, collecting revenue and verifying accounts. This job role also demands to prepare financial reports and resolving discrepancies. Other important duties are sending out payments for company credit cards, ensuring all payments are made on time and in accordance with company policy, abiding by the internal accounting controls and maintaining the database. The important skills required for this role are administrative skills, writing skills, organizational skills, data entry, and general maths skills. The individual should have knowledge of financial software and should be detail oriented. 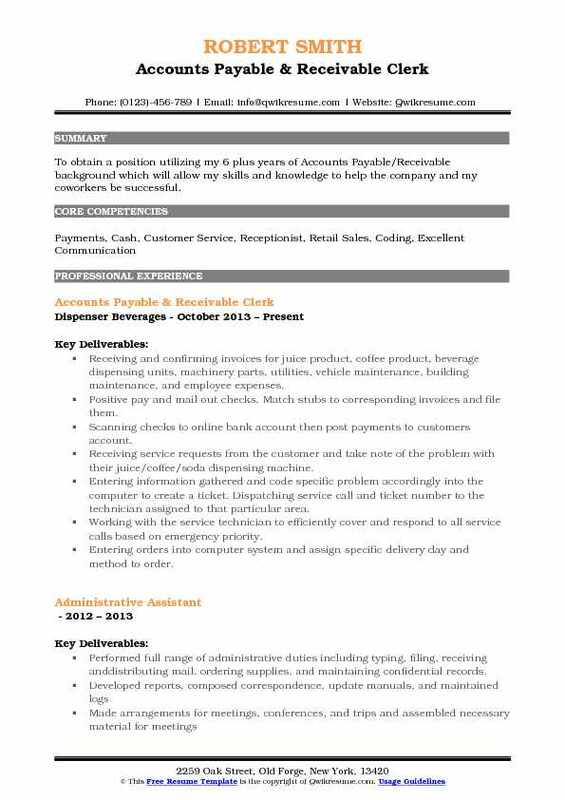 The minimum qualification required for this role is bachelors degree in business, accounting or related field. 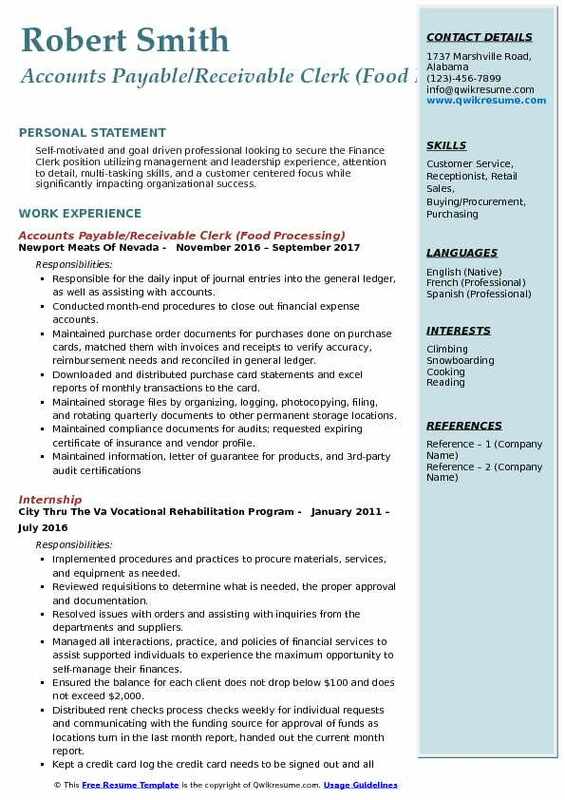 Summary : Accounts Payable/Receivable Clerk with 15 plus years of experience, excellent computer, organizational, and customer service skills. Utilize these skills to help both customers and co-workers. Efficient and accurate in performing daily work. Opened and closed monthly accounting periods for payable and receivables for both companies. Maintained propane sales receipt books and monthly comparison on fuel used. Maintained filing system and books of various reports for both companies. Figured and entered all cash deposit for brunos café incomputer system (using Astra). Totaled all cash purchase books for inspection by bureau of marine resources. Paid cash to fisherman for the catches (maintained a cash box $3,000). Figured weekly food charges for employees, to be deducted from checks. Figured employees weekly time and turned into accountants for payroll. Typed and prepared all letters to property owners regarding planning commission. Typed and prepared all agenda packets for planning commission meetings. Typed and prepared planning commission and sub-committee meeting minutes for. Resolved citizens questions and concerns regarding zoning maps & flood maps. 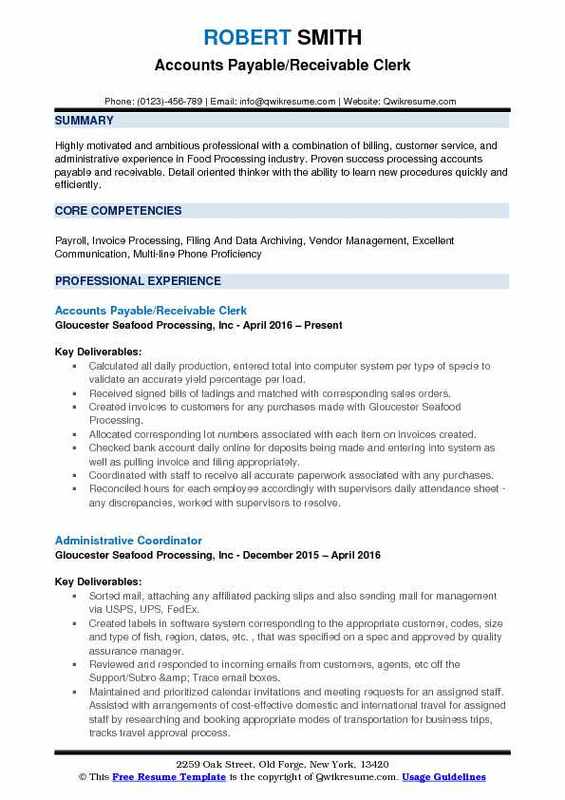 Objective : Highly motivated and ambitious professional with a combination of billing, customer service, and administrative experience in Food Processing industry. Proven success processing accounts payable and receivable. Detail oriented thinker with the ability to learn new procedures quickly and efficiently. Calculated all daily production, entered total into computer system per type of specie to validate an accurate yield percentage per load. Received signed bills of ladings and matched with corresponding sales orders. Created invoices to customers for any purchases made with Gloucester Seafood Processing. Allocated corresponding lot numbers associated with each item on invoices created. Checked bank account daily online for deposits being made and entering into system as well as pulling invoice and filing appropriately. Coordinated with staff to receive all accurate paperwork associated with any purchases. Reconciled hours for each employee accordingly with supervisors daily attendance sheet - any discrepancies, worked with supervisors to resolve. Entered hours onto an excel spreadsheet then later advanced onto a web program. Worked with staffing agency weekly to compare spreadsheets until accurate to process payroll. Entered any pay increases and or new employees according to human resource specifications. Entered vendor invoices and coded to the correct general ledger account into the computer system. Worked with logistics manager (receiving department) to receive all paperwork affiliated with invoices to be processed (purchase receipts, purchase orders, etc. ). 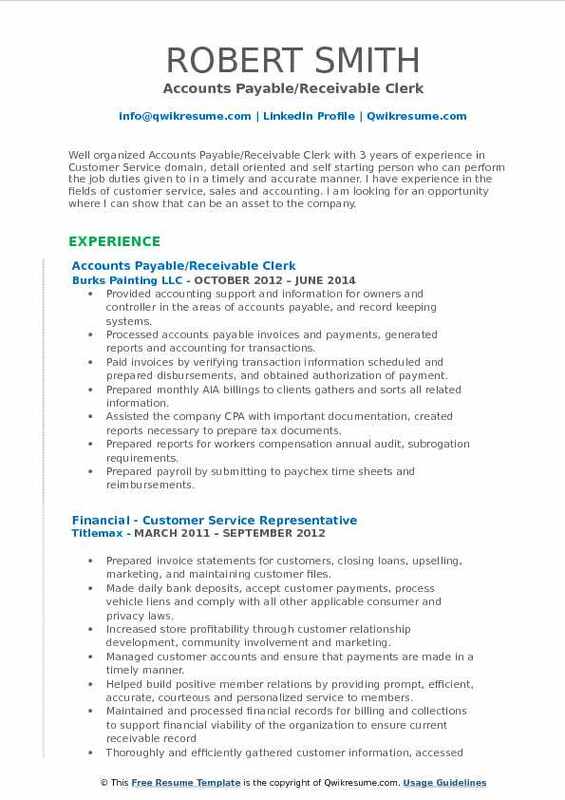 Summary : I am extremely customer service-oriented with years of 9 years of combined experience as a Senior Accounts Payable/ Receivable Clerk working with great people. I have excellent Communication skills and Core management skills. I handle tasks with accuracy and efficiency, and I always make sure I get the job done. I strive to have a positive attitude and keep a healthy relationship with my work family. Accurately input vendor invoices, time sheets, and expense reports into quick books online. Processing all vendor payments as per company pay cycle using online payment / ACH / check run. Receiving incoming mail, scanning accounts payable documents and coding them as per nature of transactions. Uploading invoices into various customer SAP portal ( ECC 6 version) and co-ordinate for payment. Creating customer invoices into quick books software, coding and routing invoices for approval. Reviewing and responding to vendor and employee inquiries on various issues. Obtaining statements of accounts from vendors/customers and performing reconciliations as needed. Effectively providing support for annual internal and external help to CPA. Maintaining, tracking, and payment all usage of company credit cards assured they were all in accordance with company travel policies and procedures. Assisting the CFO for payroll run and preparing basic data for payroll includes all payment details. 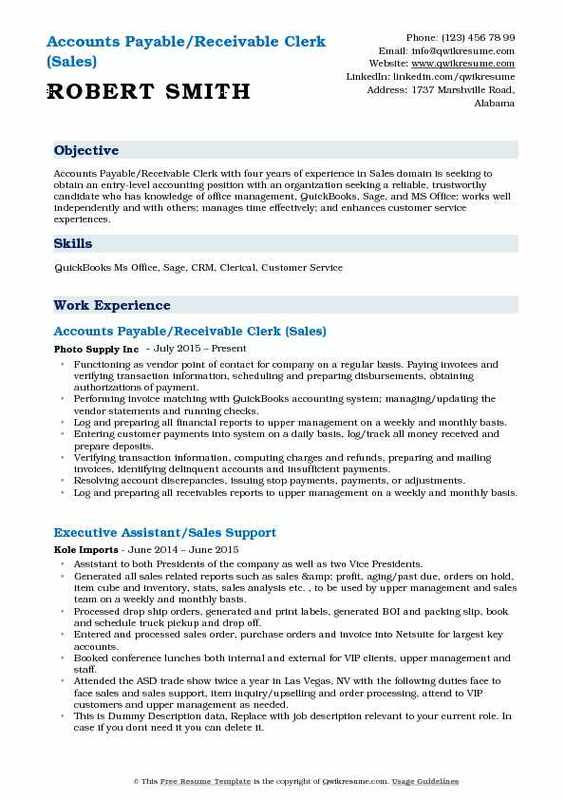 Objective : Well organized Accounts Payable/Receivable Clerk with 3 years of experience in Customer Service domain, detail oriented and self starting person who can perform the job duties given to in a timely and accurate manner. 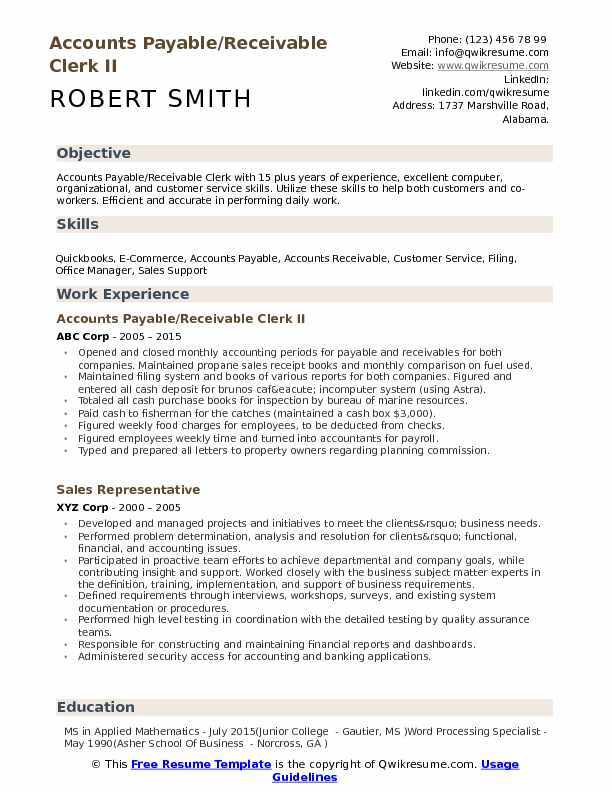 I have experience in the fields of customer service, sales and accounting. I am looking for an opportunity where I can show that can be an asset to the company. Provided accounting support and information for owners and controller in the areas of accounts payable, and record keeping systems. Processed accounts payable invoices and payments, generated reports and accounting for transactions. Paid invoices by verifying transaction information scheduled and prepared disbursements, and obtained authorization of payment. Prepared monthly AIA billings to clients gathers and sorts all related information. Assisted the company CPA with important documentation, created reports necessary to prepare tax documents. Prepared reports for workers compensation annual audit, subrogation requirements. Prepared payroll by submitting to paychex time sheets and reimbursements. Resolved account discrepancies by investigating documentation payments or adjustments. Maintained financial and project security by following internal accounting control. Maintained current as well as historical financial records by filing documents. 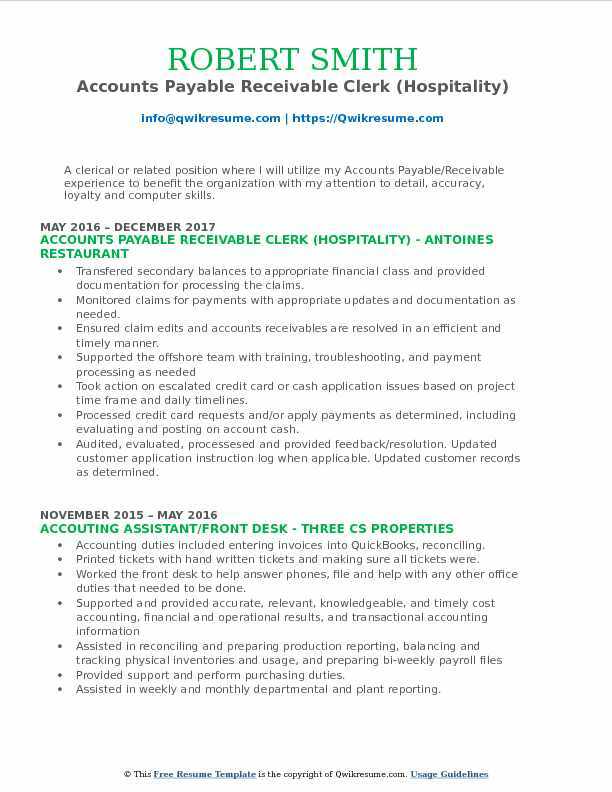 Summary : Self-motivated Accounts Payable/Receivable Clerk I with 9 years of experience, customer/company focused, personable, detailed oriented, accounting, IRA, finance, loves to work with numbers, a research professional with a successful, solid education and employment background seeking a new career. Gained experience across multiple positions as I worked up from entry-level product sorting to machine operation, then on to shipping & receiving, to ultimately managing some administrative level functions. Responsible for accounts receivable/payable operations, along with work in inventory control, customer service, sales & website management as well as database management for advantage accounting systems, Microsoft access, and ame. Aided in successfully launching a new retail product & assisted in fostering a distribution network for top brass products in retail. Responsible for accurate cash account tracking and reconciliation while managing outstanding accounts payable and receivable. Accepting payments from customers with house accounts or any credits from vendors and processing those accordingly. Completed filing in accordance with departmental procedures. Maintaining all the payable files including all utility bills, insurance. 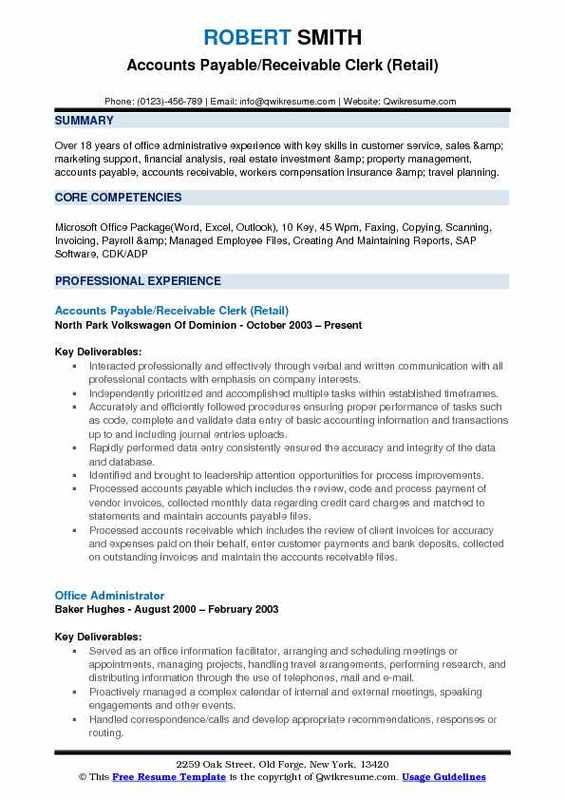 Objective : Accounts Payable/Receivable Clerk with four years of experience in Sales domain is seeking to obtain an entry-level accounting position with an organization seeking a reliable, trustworthy candidate who has knowledge of office management, QuickBooks, Sage, and MS Office; works well independently and with others; manages time effectively; and enhances customer service experiences. Functioning as vendor point of contact for company on a regular basis. Paying invoices and verifying transaction information, scheduling and preparing disbursements, obtaining authorizations of payment. Performing invoice matching with QuickBooks accounting system; managing/updating the vendor statements and running checks. Log and preparing all financial reports to upper management on a weekly and monthly basis. Entering customer payments into system on a daily basis, log/track all money received and prepare deposits. Verifying transaction information, computing charges and refunds, preparing and mailing invoices, identifying delinquent accounts and insufficient payments. Resolving account discrepancies, issuing stop payments, payments, or adjustments. Log and preparing all receivables reports to upper management on a weekly and monthly basis. Maintaining all financial records by filing accounting documents accurately. 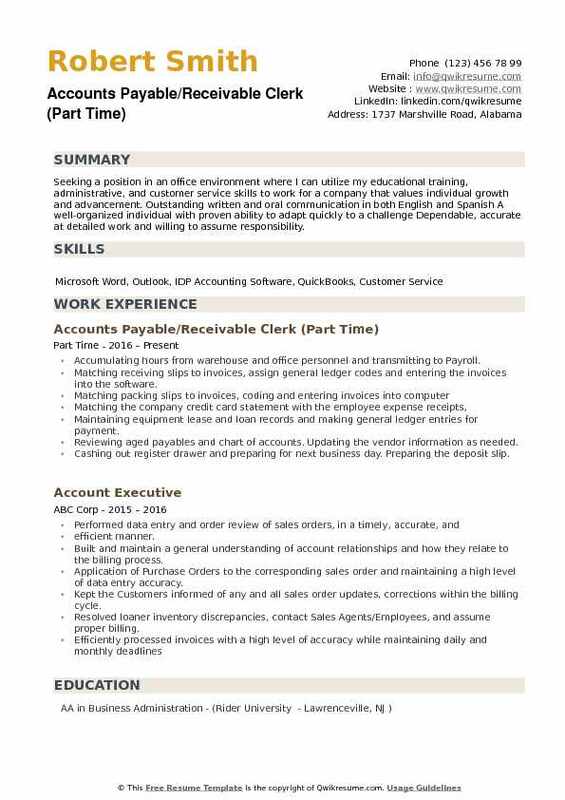 Objective : A clerical or related position where I will utilize my Accounts Payable/Receivable experience to benefit the organization with my attention to detail, accuracy, loyalty and computer skills. Transfered secondary balances to appropriate financial class and provided documentation for processing the claims. Monitored claims for payments with appropriate updates and documentation as needed. Ensured claim edits and accounts receivables are resolved in an efficient and timely manner. Took action on escalated credit card or cash application issues based on project time frame and daily timelines. Processed credit card requests and/or apply payments as determined, including evaluating and posting on account cash. Audited, evaluated, processesed and provided feedback/resolution. Updated customer application instruction log when applicable. Updated customer records as determined. Received documentation and reconciled hotel invoices with crew scheduling system and hotel contracts before authorizing payments. Headline : To obtain a position utilizing my 6 plus years of Accounts Payable/Receivable background which will allow my skills and knowledge to help the company and my coworkers be successful. Receiving and confirming invoices for juice product, coffee product, beverage dispensing units, machinery parts, utilities, vehicle maintenance, building maintenance, and employee expenses. Positive pay and mail out checks. Match stubs to corresponding invoices and file them. Scanning checks to online bank account then post payments to customers account. Receiving service requests from the customer and take note of the problem with their juice/coffee/soda dispensing machine. Entering information gathered and code specific problem accordingly into the computer to create a ticket. Dispatching service call and ticket number to the technician assigned to that particular area. Working with the service technician to efficiently cover and respond to all service calls based on emergency priority. Entering orders into computer system and assign specific delivery day and method to order. Helping the delivery driver to organize the delivery schedule for the next day as well as helping to ensure the driver has the correct amount of product in the delivery truck. 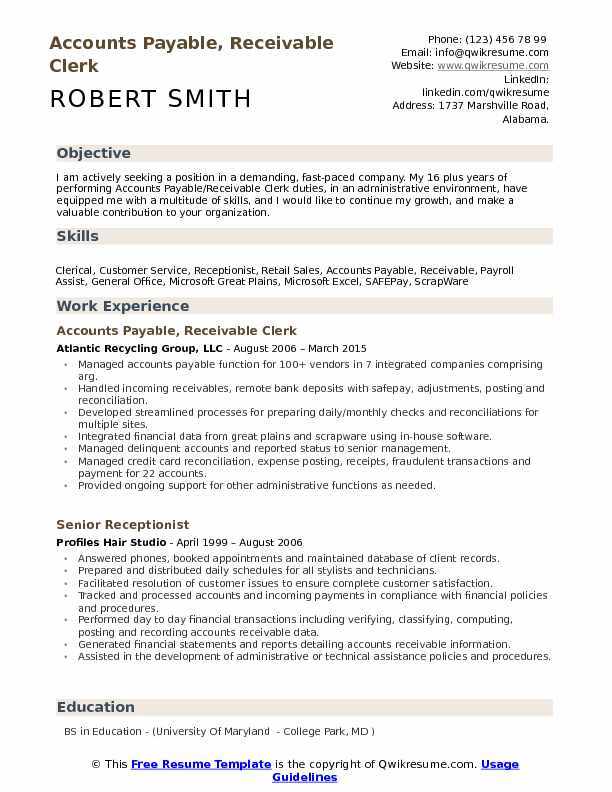 Summary : Seeking a position where I can utilize my 17 plus years of Accounts Payable/Receivable Clerk III experience, professional skills to add value to your organization. Executed accounts receivable reporting enhancements and reconciliation procedures. Managed accounting operations, accounting close, account reporting and reconciliations. Received, recorded, and banked cash, checks, and vouchers as well as reconciled records of bank transactions. Drafted and reviewed financial statement compilations before being approved by partners. Assisted in the creation of vendor contracts for outside vendors. Assisted management with the finalization of the annual expense plans. Performed periodic budgeting/modeling to project monthly cash requirements. Prepared financial pages for presentation to senior management. Reviewed collection reports to determine the status of collections and the amounts of outstanding balances. Worked with management to document and offset unusual expense variances in their respective areas. Objective : Seeking a position in an office environment where I can utilize my educational training, administrative, and customer service skills to work for a company that values individual growth and advancement. Outstanding written and oral communication in both English and Spanish A well-organized individual with proven ability to adapt quickly to a challenge Dependable, accurate at detailed work and willing to assume responsibility. Accumulating hours from warehouse and office personnel and transmitting to Payroll. Matching receiving slips to invoices, assign general ledger codes and entering the invoices into the software. Maintaining equipment lease and loan records and making general ledger entries for payment. Reviewing aged payables and chart of accounts. Updating the vendor information as needed. Cashing out register drawer and preparing for next business day. Preparing the deposit slip. Entering customer charges and recorded credit card/debit card transactions. Summary : I am actively seeking a position in a demanding, fast-paced company. 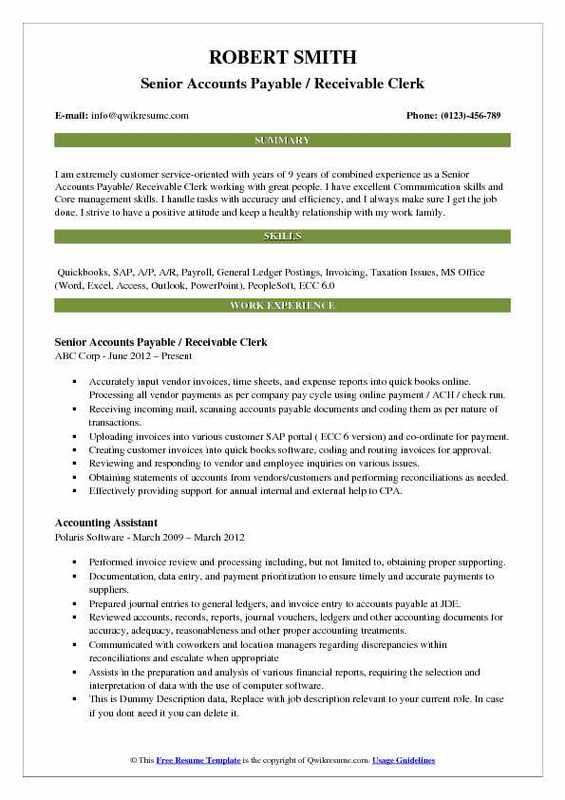 My 16 plus years of performing Accounts Payable/Receivable Clerk duties, in an administrative environment, have equipped me with a multitude of skills, and I would like to continue my growth, and make a valuable contribution to your organization. Managed accounts payable function for 100+ vendors in 7 integrated companies comprising arg. Handled incoming receivables, remote bank deposits with safepay, adjustments, posting and reconciliation. Developed streamlined processes for preparing daily/monthly checks and reconciliations for multiple sites. Integrated financial data from great plains and scrapware using in-house software. Managed delinquent accounts and reported status to senior management. Managed credit card reconciliation, expense posting, receipts, fraudulent transactions and payment for 22 accounts. Provided ongoing support for other administrative functions as needed. Resolved software issues encountered during multiple great plains upgrades. 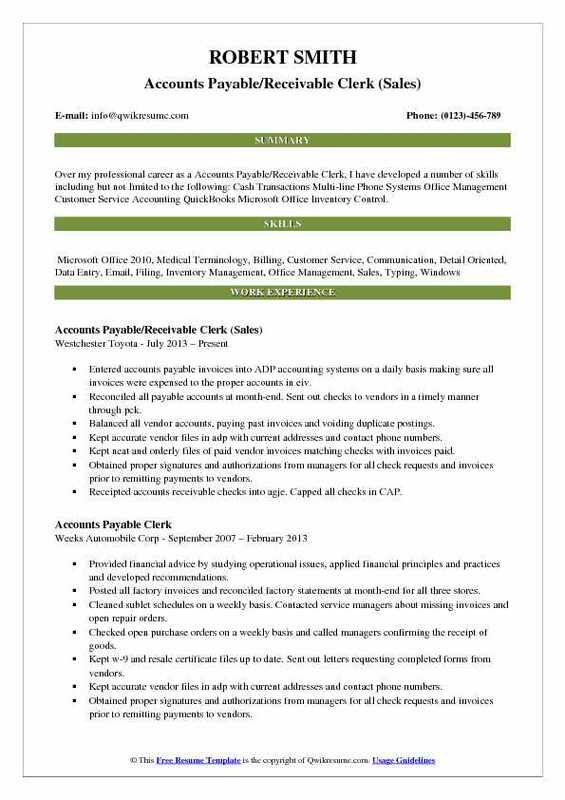 Summary : Over 18 years of office administrative experience with key skills in customer service, sales & marketing support, financial analysis, real estate investment & property management, accounts payable, accounts receivable, workers compensation insurance & travel planning. Interacted professionally and effectively through verbal and written communication with all professional contacts with emphasis on company interests. Independently prioritized and accomplished multiple tasks within established timeframes. Accurately and efficiently followed procedures ensuring proper performance of tasks such as code, complete and validate data entry of basic accounting information and transactions up to and including journal entries uploads. Rapidly performed data entry consistently ensured the accuracy and integrity of the data and database. Identified and brought to leadership attention opportunities for process improvements. Processed accounts payable which includes the review, code and process payment of vendor invoices, collected monthly data regarding credit card charges and matched to statements and maintain accounts payable files. Processed accounts receivable which includes the review of client invoices for accuracy and expenses paid on their behalf, enter customer payments and bank deposits, collected on outstanding invoices and maintain the accounts receivable files. Monthly closed process for assigned entity to include G/L maintenance & reconciliations. 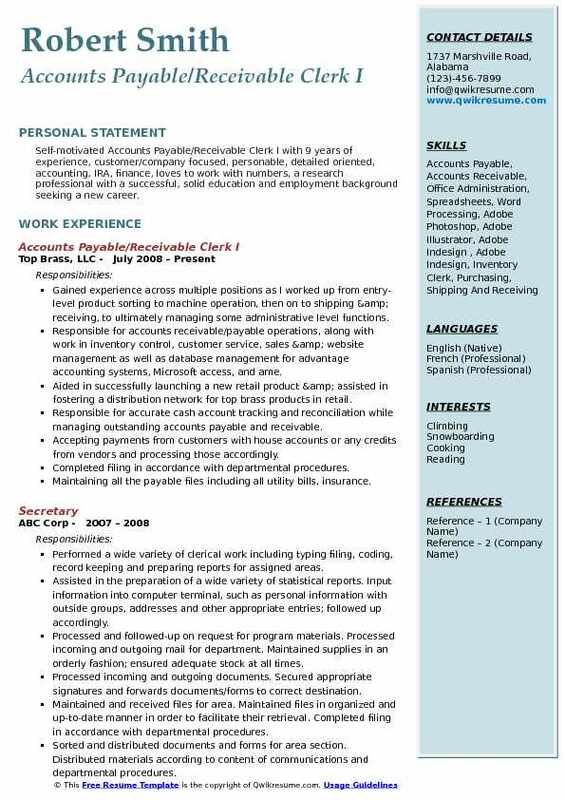 Summary : Over my professional career as a Accounts Payable/Receivable Clerk, I have developed a number of skills including but not limited to the following: Cash Transactions Multi-line Phone Systems Office Management Customer Service Accounting QuickBooks Microsoft Office Inventory Control. Entered accounts payable invoices into ADP accounting systems on a daily basis making sure all invoices were expensed to the proper accounts in eiv. Reconciled all payable accounts at month-end. Sent out checks to vendors in a timely manner through pck. Balanced all vendor accounts, paying past invoices and voiding duplicate postings. Kept accurate vendor files in adp with current addresses and contact phone numbers. Kept neat and orderly files of paid vendor invoices matching checks with invoices paid. Obtained proper signatures and authorizations from managers for all check requests and invoices prior to remitting payments to vendors. Receipted accounts receivable checks into agje. Capped all checks in CAP. Recorded and maintained all 1099 informationProcess, 1099 year end forms and reports. Entered finalized cash receipts and update receivable ledger, researched and processed the bad checks for collection. 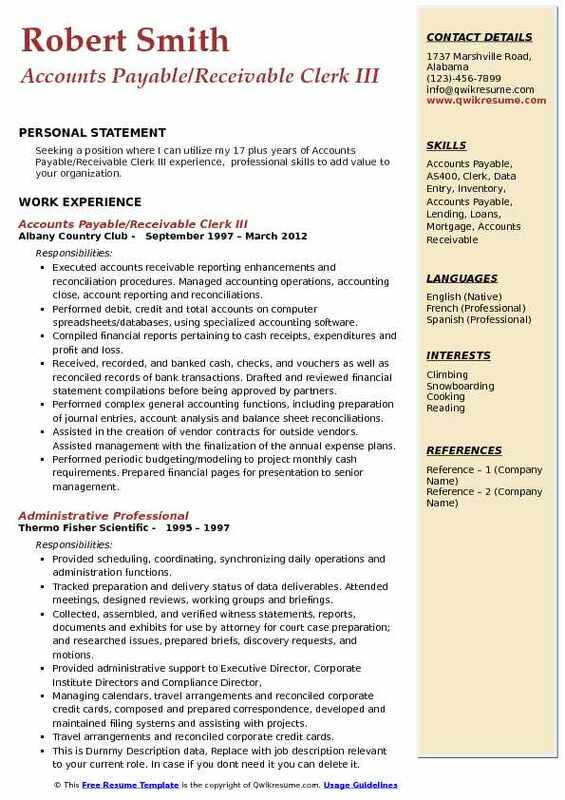 Summary : To continue the development and utilization of my professional Accounts Payable/Receivable Clerk skills and base of knowledge while promoting a functional organization and serving as a positive role model and employee for team members and the company as a whole. Created daily cash deposits consisting of checks and credit card payments and applied cash receipts towards customer A/R balance. Answered and directed telephone calls to the appropriate departments; distributed incoming mail. Performed various administrative tasks: filing, copying, data entry, ordering office supplies, etc. Filled in spreadsheet daily with the totals of the day for all 4 stores. Cross reference daily incoming vendor invoices to match store purchases for accuracy, researched and resolved incorrect invoices. Called vendors to request copies of invoices or credits or to resolve any invoice discrepancies. Coded vendor invoices with the correct account numbers and vouchered vendor invoices for check run. Performed invoice processing, check printing/mailing, PO, advising and mentoring employees, journal vouchers, due to due from, boe filing, mailing 1099s, excel spreadsheets for different accounts, credit card payments,. Headline : Self-motivated and goal driven professional looking to secure the Finance Clerk position utilizing management and leadership experience, attention to detail, multi-tasking skills, and a customer centered focus while significantly impacting organizational success. Responsible for the daily input of journal entries into the general ledger, as well as assisting with accounts. Conducted month-end procedures to close out financial expense accounts. Maintained purchase order documents for purchases done on purchase cards, matched them with invoices and receipts to verify accuracy, reimbursement needs and reconciled in general ledger. Downloaded and distributed purchase card statements and excel reports of monthly transactions to the card. Maintained storage files by organizing, logging, photocopying, filing, and rotating quarterly documents to other permanent storage locations. Maintained compliance documents for audits; requested expiring certificate of insurance and vendor profile. Updated and maintained records of expenditures, sent out payments for company credit cards, responded to vendor invoices, ensuring that all payments are made in accordance with company policy and resolving payment discrepancies and disputes on behalf of the company.